Wilderness junkies finally have a Denver basecamp for getting down to business. Wayfinder Co-op, a coworking space for outdoor enthusiasts and businesses, will be opening its doors this January. Founders Joe Ewing, Britten Ferguson and Chris Baker signed a lease for the office in 7,750 square feet at 525 Sante Fe Drive. So far, 23 companies have signed letters of intent to move in. Ewing and Ferguson previously worked out of Baker’s 500-square-foot office on Platte Street. 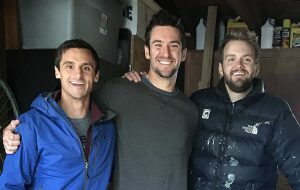 When Baker’s lease was ending, the three founders of outdoor-related businesses needed to find new space, and hatched the idea for Wayfinder. The company is paying $17 per square foot for its new space, which used to be a Paper Plus office. Tom McLagan with Dunkeld-14 and Hyder Construction is the property’s landlord. 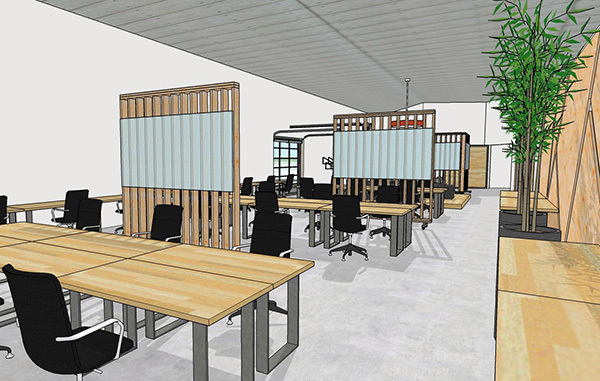 Wayfinder will provide the normal perks of a coworking space – free coffee, beer and printing. The space has room for eight private offices, 24 dedicated desks and 50 “flex members,” Ewing said. The coworking space plans to charge at least $315 per month for a dedicated desk and $550 per month for a private office. Unlike other coworking spaces in Denver, outdoor entrepreneurs have the chance to be co-op members for $100 per month, which gives them access to yearly dividends. And Wayfinder will be extra outdoorsy. “There are going to be hammocks and dogs,” Ewing said. The coworking space plans to have discounted gear deals and memberships to nearby climbing gym Movement Climbing + Fitness. Tenants and co-op members also can rent pop-up retail space to showcase products or guiding trips in the cafe area, Ewing said. Carabiner Coffee will have a broken-down VW van as the centerpiece of its cafe in Wayfinder, and members will have access to a mapping room to plan their next excursion. The co-founders invested roughly $30,000 in personal funds and $100,000 in outside capital to launch. Hyder Construction and Nick Allen are the general contractor and architect, respectively. The office is blocks from coworking space Battery 621.